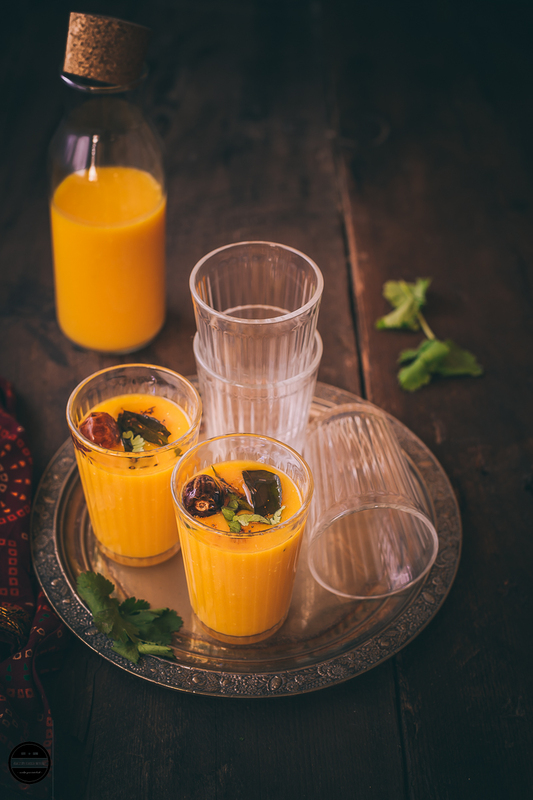 How to make Fajeto | Fajeto is an authentic Gujarati beverage that is prepared with ripe mango pulp, yogurt and topped with an aromatic tempering. 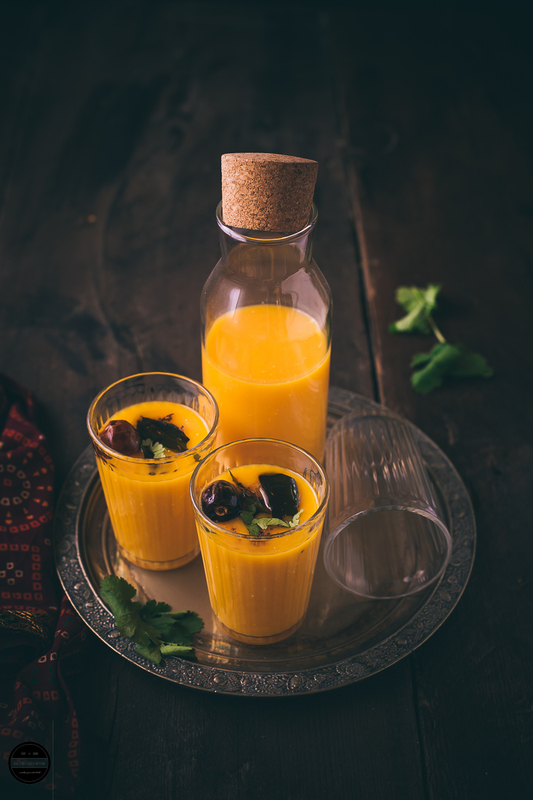 Usually, Fajeto is prepared during the summer season and served the end of a meal to help calm down the stomach after a spicy meal in a Gujarati household. 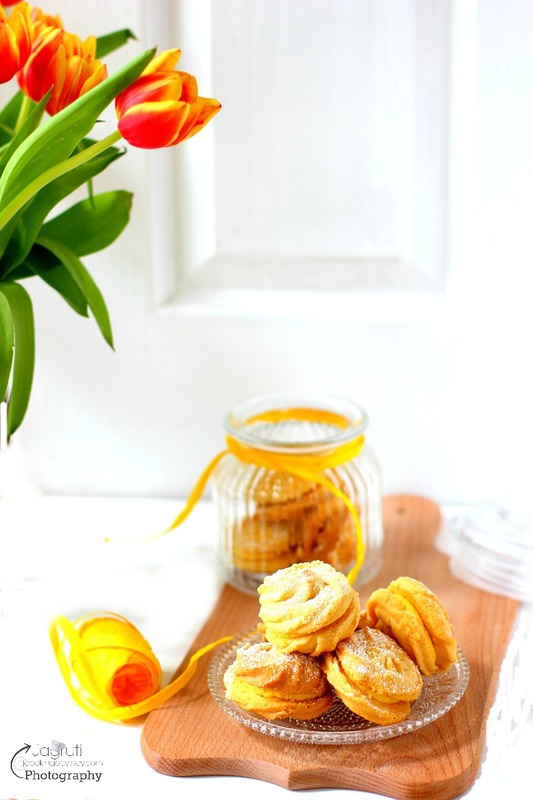 Basically, this recipe was invented to save the waste anything from the mango as mango is an expensive fruit so really you want to make sure that you don't waste any part of it. For Gujaratis Mango is just not the fruit, it's an emotion. We love mangoes handle it with so much care. I have numerous memories of those summer holidays which I spent in India while growing up. 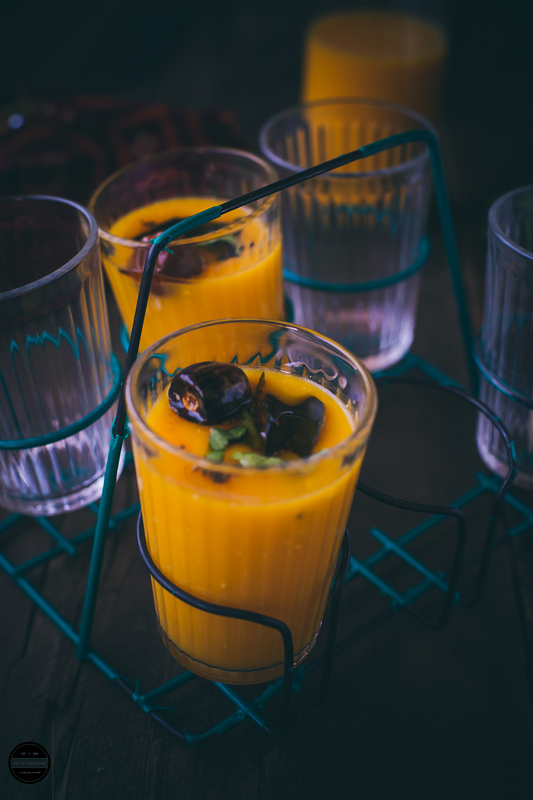 When there were no mixer or blenders entered our homes in India, the older generation had their own technic to juice the mangoes. yes, most of the Gujarati families enjoy keri No ( Mango) ras ( ras translates pulp) but my mum always enjoyed mango slices. so I hardly have seen any Mango ras in my parent's house. As I always love food, while even I was a very young girl, I was always intrigued. For mango ras I have to give a credit to our next door neighbour ' Jasi Baa' When the mango arrives, her job is to sit down in the front garden in the early morning with a couple of dozens ripe and juicy mangoes and slowly and so caringly she would make mango ras for her joint family, and my job to keep watching her and thinking when I'll be making a Mango ras just like her. (Mind you I was only 7-8). The whole process to make Mango ras was so therapeutic for me. So after a couple of years, one morning I asked my Mum to give me a few mangoes and waited for 'Jasi Baa' to come in her front garden and I started following all her methods. She told my Mum' She is going to be a good cook' she called me and I sat down next to her and showed me how to extract the mango pulp. After she finished juicing her mangoes she told me now all these skin, seeds are left what we are going to do with it? I told her ' Shall I go and feed the cow?' she told me 'No, we will extract more juice from these by adding some water and will make Fajeto' I started giggling as 'Fajeto' translates 'messed up' then I left from there. That same afternoon her granddaughter who also was my best buddy came home with a bowl of fajeto and we really enjoyed it. Next summer we left that area, years went by but never forgot that taste of fajeto, Mum never made it. On a fine lucky day, I met her granddaughter in a market when we were all grown up, so happy to see each other. I asked about her Grandmother 'Jasi Baa' and told her how I still yearn for her fajeto. She told me that she passed away few years back, but she can get a recipe from her Mum and we exchanged our addresses. I was surprised, they bought a house just near where we were living. It is a small world! After a couple days she visited our house with their whole family and gave me a fajeto recipe, I was the happiest girl that day. I waited for the mango season and prepared it according to her recipe, that day I felt once again 'Jasi Baa' has sent me another bowl of fajeto. Since then, whenever I get hold of delicious and juicy mangoes (either Alphonso or Kesar) I never forget to prepare Fajeto in my kitchen! So let's see what fajeto is and how do you prepare it? Fajeto, made with mango pulp, nowadays you can prepare from the readymade mango pulp too, but in that old age it was made from the Mango skin and seeds which were already squeezed out then washed them in the water..added some spices, sweetener such as jaggery or sugar and yogurt, then very mild tempering added on the top. So how do I make fajeto, do I use all those mango skins and seeds in the water, no I use fresh Mango pulp which I prepare in a mixer or blender then thin it out with the water and prepare it. If you can't find fresh mango, use canned mango pulp. In a big saucepan mix mango pulp, water, salt, jaggery and crushed chilli ginger. Heat this mixture on a medium heat for 4-5 minutes. Turn off the heat and leave it to cool for a bit. Then add beaten yogurt and mix well. Now prepare the tempering by heating oil in a small pan, add mustard seeds, hing, curry leaves and dried red chilli. Once it crackles add it into the prepared fajeto. Add dried ginger powder, mix well and let it cool at the room temperature. Serve in a glass, garnish it with the coriander leaves. I love anything and everything made with mango.. too good. Thanks Shobha, I too love mango and mango dishes. Thanks Malini, glad you like this recipe. Hi Jagruti, I am touched by your this post. Yes, there are people who always stay special in our heart. This is new for me. Seeing the title, Fisrt I thought it's some continental dish. I can feel the sweet, spicy and tangy fajeta. And I can see your happiness with this glass in your hand. First of all, gorgeous clicks as usual!! I love the combo of mangoes with spices...especially chillies! Beautiful share! Very touchy post dear. So true , some people leaves such good impression on our heart. Fajeto , love it. Beautiful clicks..
Wow, the humble fajeto looks so exotic, love the presentation!! The drink sounds so unique with tempering on top and so flavourful! That's a lovely new recipe I've learnt today for a mango drink. Loved reading your post Jagruti..coming to the dish , I have never had a chance to taste Fajeto..but your pics makes me crave for it..simple recipe but full of flavors ! Reading this post I too went in my old days. Beautiful writeup with memories. Now for the recipe I find it very interesting, will try for sure, mango juice with such spices surely gonna taste great. I have never tried Fajeto and always thought it was mango kadhi. Love reading your nostalgic memories and the pics takes it to a whole new kevel.